« Foodzie is Etsy for Food! 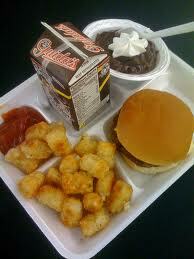 How are you observing National School Lunch Week? Despite having a 2nd-grader in public school, I had no idea it was National School Lunch Week until I read the latest post on Marion Nestle’s blog, Food Politics. We are lucky to be part of a public school with an active parent body that includes a chef who is working to change the way our kids eat. That said, I was amazed to walk into the lunch room when my daughter started school to find that it hadn’t changed much since I stood in the lunch line 30 years ago. So what is a parent to do? Well, The Center for Ecoliteracy has published a 2nd edition of their guide, “Rethinking School Lunch” which offers a useful framework for how schools can provide healthier meals. It’s easy to download and my goal is to read it through by the end of the week. Peanut butter is out, of course, as are other nuts that would be good snacks. We are starting to get the timing down – heating up the food right before walking out the door with the vague hope that it will still be hot and appetizing by lunchtime. But we are looking for new ideas – what foods do you send to school with your child? Any triumphs? Humiliations? Please share! This entry was posted on October 12, 2010, 9:21 am and is filed under kids. You can follow any responses to this entry through RSS 2.0. You can leave a response, or trackback from your own site. Why is peanut butter out? Cucumber and cream cheese sandwiches? Your kids are right to reject them. The only food that trumped pb&j at school was if a kid were lucky enough to show up with McDonalds, Burger King or Wendy’s after seeing the doctor or something. Everyone is allergic to peanut butter these days, Ari. Hence the school-lunch quandry! Remind me to ask Dorie what she packed for you back in the day. I bet you got corned beef on rye. S and M eat the same things everyday, they want no variation (to my dismay), although S’s is relatively healthy. Peanut butter and banana on whole wheat for S. if I don’t have banana for some reason, I add sliced apples to the sandwich. Cream cheese on whole wheat that I try to doctor up as best I can for M (a very picky and unvaried eater). Snacks are always apples, cheese stick and/or yogurt tube, some other fresh fruit, bag of peanuts, something of the crunchy/salty variety, granola bar and/or cookie for S (but not cavity-prone M). I pack extra stuff that they don’t get to at lunch, items that I think can keep until after school so I don’t nec have to bring other snacks at pickup (but often seem to anyway). I’m glad to hear you serve food meant to be served warm, I’m mistrustful of trying this for some reason (mostly because I don’t know how it would hold up taste/appetizing-wise and kind of health-wise too…though clearly you guys have never had any problems with the latter.